Dr. Silke Severmann joins this expedition with a very diverse background. Though she did not always aspire to be a widely published Geochemist, she has pursued this career with passion. She gained both her M.S. 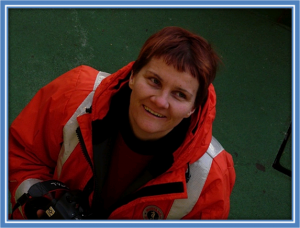 in Oceanography and her Ph.D. in Marine Geochemistry while studying at the University of Southampton in the UK. She has traveled extensively for both her education and research, and continues to write, teach, and mentor students in the field she loves so much. During this cruise, she will be collaborating with Dr. Berelson and Dr. McMannus to investigate the sediment chemistries of both the anoxic and off-shore waters, specifically looking for the levels of Iron, Carbon, and Oxygen in the samples. 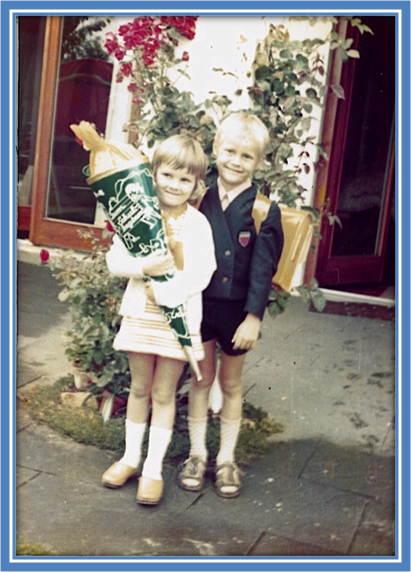 This is my brother’s first day at school, where he allows me to hold his Schultüte, a cone filled with candy and school utensils. My first day at school was a year later. into programs that offered marine sciences. Q: What classes did you choose to take in HS? What were your majors in undergrad/grad school? Was there a favorite, least favorite? A: I chose biology, maths, geography and arts as my primary subjects in high school. Funnily enough, my least favorite subjects in school were foreign languages (I grew up in Germany and I had to take English and French at school). In fact, I nearly had to repeat a year because my grades in those two subjects were so bad. As it turns out, I decided to travel to Ireland and Scotland during my first year at university. During those travels I couldn’t really avoid talking to the locals and I soon realized that I actually learned a lot more English at school than I had thought. While traveling and meeting people, the language came alive for me, and speaking English suddenly became fun. And if you’d speak to me today you would never guess that I once dreaded my English classes. At university, my undergraduate degree was in geography with geology, and it was only later that I switched to oceanography – it’s a complicated story, because I moved from Germany to England in the last year of my undergrad degree, which allowed me to change my major. Q: What bit of advice can you offer to our future scientists and explorers following on this blog? A: I don’t come from a family with an academic background, so I couldn’t just follow in somebody else’s foot-steps, I had to figure out for myself how to go about getting a university degree and turn that into an academic career. When I started out as I student I never thought in a million years that I would end up as an Assistant Professor living on the other side of the Atlantic Ocean, and traveling all over the world for my job (last winter I got to go to Antarctica, what an amazing trip!) How did I get here? Well, step by step, sometimes big steps, but often very little steps. Sometimes I moved forward with the determination of a migrating whale, but often I simply drifted along like the plankton in the ocean, until I figured out what my next step should be. Having lofty goals and great ambitions is certainly a good idea, but sometimes it can be very overwhelming, and that’s when it’s better to stick to small steps. My other advice on learning science is to do what I did when I learned English: make the science come alive. Get out of the classroom, away from the computer, close the books for a while; instead go out and get your hands dirty and your feet wet. Science, like everything else, is so much easier to learn if you get to do it rather then read about it. We often have undergraduate and college students coming to visit our labs to gain some experience, and most of us are happy to have you stick around for a while. Just ask! That’s why COSEE is such a great institution, it gives you an opportunity to meet real scientists.